Is Your Spouse Waging Divorce War? In the 1989 movie “The War of the Roses” a married couple going through a bitter divorce, used unreasonable tactics to pressure the other spouse to move-out of the home pending their divorce. Unfortunately, in some Florida family court cases, spouses are engaging in the same or similar tactics and stratagem. Legal Representation: Most war waging spouses look for the meanest, nastiest lawyers to represent them. The intent is to use their attorney to pound the other spouse with endless litigation and paperwork. However, many courts and State Bar Associations frown upon attorneys who are overly aggressive and resistant to settlement. If the court finds that a spouse or their attorney has engaged in litigious conduct, the spouse and/or attorney can be sanctioned by the court. Using Discovery to Gain Intelligence: In a contested divorce, serving discovery and obtaining intelligence is critical. Discovery is a legitimate litigation tool that allows parties to request and obtain documents and information from the other side or other entities that are relevant to the proceedings. However, some spouses use the discovery process to annoy and harass the other spouse, by serving them with extensive and burdensome discovery requests. If this is the situation in your case, your divorce attorney can help quell their abuse of discovery. Using Expert Witnesses to Espouse a False Narrative/Propaganda: Depending on the issues in dispute, a war waging spouse may hire expert witnesses, such as forensic accountants, doctors, vocational rehabilitation counselors, or other professionals to help support their claims. Seasoned attorneys often work withthe same experts, and can help you defeat expert opposition. Using Law & Motion Hearings as a Blitzkrieg: In World War II the German Army devised an intense military plan to quickly end military conflicts, using overwhelming fighting power from land, sea and air. In many divorce cases, parties often complain that their spouse is always dragging them to court, or that they are always responding to motions or other pleadings filed by the other spouse. To a war waging spouse, this is their way of keeping their ex-spouse under pressure. Settlement, Trial or Self-Annihilation: Ultimately, there is light at the end of the tunnel for a contested divorce. By way of a settlement or by trial the Judge will act as a fact-finder and will make final court orders. If the war waging spouse is resistant to settlement, and wants to push towards trial, then he or she is probably more interested in fighting-to-the-death, with no regard for loss of finances or property. If this is the case in your divorce, you need experienced Florida Divorce attorneys on your side. At Arwani Law Firm we are committed to helping couples dissolve their marriage with dignity and respect. 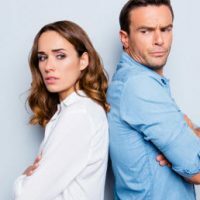 If you have a high conflict divorce and it appears that your spouse is waging divorce war at you, contact the experienced Orlando Florida Family Law attorneys at Arwani Law Firm .